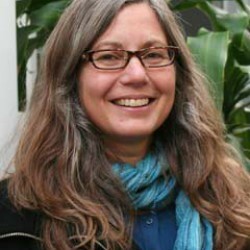 Professor and Co-Director of the Center for Tropical Ecology and Conservation, Antioch University New England, USA, Prof. Beth Kaplin holds a PhD in Zoology, University of Wisconsin Madison. Her area of interest and expertise include plant-animal interactions, seed dispersal ecology, tropical forest ecology and restoration, matrix and edge effects, protected area management and capacity building. Much of Beth's work is focused in the Albertine Rift, where her main study site is the Nyungwe National Park in Rwanda, where she has worked since 1990 when doing her PhD. Her areas of interest include the development of the Regional Network for Conservation Educators in the Albertine Rift (RNCEAR) in collaboration with colleagues in the Biology Department, National University of Rwanda with MacArthur Foundation funding; annual workshops of the RNCEAR beginning in 2008. Received funding to continue this network through 2014, and the development of a Masters in Biodiversity Conservation at National University of Rwanda, which was launched in January 2011, including writing curriculum, modules, managing stakeholder workshops, and hiring instructors.